Theresa May announced an increase in NHS funding by 3.4 per cent a year for the next 5 years on 17 June. But the headline 3.4 per cent increase only applies to the NHS England budget and not to the whole NHS budget. Importantly, it also excludes medical and nurse training and public health budgets although these are crucial to the delivery of NHS services. The overall increase promised is in fact only 3 per cent a year. While any funding increase is to be welcomed, 3 per cent will not be enough to repair the damage already done to the NHS from years of austerity. At least a 5 per cent real uplift next year would be needed to begin to begin to repair the damage done and at least 4 per cent per year is essential after that to ensure the NHS is fit for the future. As always with the Conservatives, the devil will be in the detail. We don’t know exactly how this money will be allocated and what strings will be attached. In 2016 the government announced a £10billion a year increase. However, due to some accounting tricks involving moving money around within the Department of Health budget, according to the Nuffield Trust it resulted in only £800million in real terms. This promised increase must be genuine new money and not a repeat of the ‘smoke and mirrors’ designed to appease the public without resulting in any significant benefits. And the resurrection of the tarnished claim of a ‘Brexit dividend’ to fund the NHS is political gamesmanship, when most analysts predict a negative fiscal impact, at least in the short term. While Theresa May talks of extra funding ‘not being wasted’, there are no policy measures to ensure that increased funding actually improves health care delivery rather than paying for the private market and the wasteful bureaucracy the government has created. There must be an end to the fragmentation of the NHS and the enforced contracting out of NHS services to the market. The NHS must be reinstated as a public service. Currently billions of pounds are wasted on market transaction costs and outsourcing to the private sector. And NHS efficiency, co-ordination of services and collaborative delivery of care is undermined by competition. And with no promised increase in social care funding any funding increase for the NHS will have limited benefit. Social care has suffered from extremely damaging cuts over the past eight years and this has adversely impacted the NHS. Social care cuts have caused real suffering and an increased mortality rate in those who are directly affected, so any new funding settlement for the NHS requires increased funding for social care. Think-tank estimates argue for a 3.9 per cent annual uplift in real terms for social care. There should be no pretence that “integration” of health and social care, without extra funds for both, will solve the problems of either service. True integration will require social care to be brought into the NHS as a public service and to be properly funded. Health Campaigns Together, Keep Our NHS Public and the People’s Assembly, NHS staff, other campaigners and concerned members of the public are continuing to apply pressure on this government to fund the NHS properly and reinstate it as a public service according to its founding principles as this is the most economical way to run the system and deliver high quality care for all. And they will all be calling for these demands on 30 June at the celebration and protest in defence of the NHS at its 70th birthday demonstration in London. Remarking on May’s announcement, Dr Louise Irvine, a GP in Lewisham, south London, and co-chair of Health Campaigns Together, said: “The Conservative government’s promised funding increase for the NHS is too little too late. “It is in fact only 3 per cent a year – they’ve done their usual smoke and mirrors to make it appear more by only counting the increase to the NHS England budget and not the overall Department of Health budget. “4 per cent is the minimum increase needed. 3% won’t be enough to repair the untold damage the Tories have done to the NHS over the past eight years of austerity or secure its future as a high-quality service. “I fear that patients will continue to suffer needlessly and staff will continue to leave the profession due to stress and burnout. “We’ll see more rationing, cuts and closures and insufficient improvement, if any, in waiting times. “Any increase in funding is welcome but it is a missed opportunity to put the NHS back on its feet. “There’s so much more the government could and should do. “It could stop wasting precious NHS resources on the failed experiment of the market and outsourcing and reinstate the NHS as a public service – the only way to ensure effective and efficient joined up services. And Dr Tony O’Sullivan, a retired paediatrician, and co-chair of Keep Our NHS Public, said: “The NHS and social care have been severely damaged by the last 8 years of wilful neglect. “NHS workforce planning was abandoned leaving 100,000 vacancies and doctors and nurses working in extremes of pressure and ending up in tears of distress. “They do not need more mischievous statements, previously exposed as lies, about ‘Brexit dividends’ that smack more of electioneering than care for the NHS. 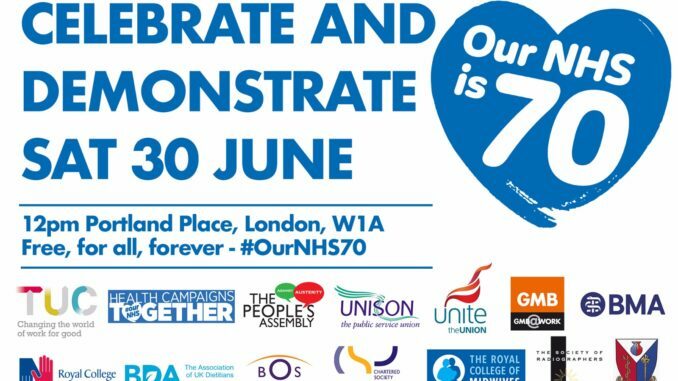 The 70th birthday rally and demonstration, supported by Health Campaigns Together, Keep Our NHS Public, The People’s Assembly Against Austerity, the TUC and 13 health unions, is on 30 June, and starts at 12midday, assembling at Portland Place, London, and then proceeding to Whitehall.